Then how about 30 great deals? In June you’ll find a different deal each day on my website—a product special available only that day and only while supplies last. 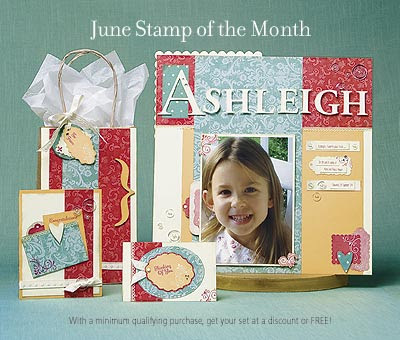 Watch for popular products offered FREE with a stamp set purchase (size A, B, C, D, or E only; excludes K-size and Stamp of the Month) and all-the-rage goodie boxes filled with enviable items priced well below retail. Irresistible shipping discounts are included! Deals are available for 23 hours beginning on the day announced and while supplies last. New deals are posted at 9:00 am MT (that's 10:00 am CT) each day of June. This month we've got a very cute and very versatile Stamp of the Month - "Tender Tags". It's perfect for gift tags, card making and journaling accents on scrapbook pages.